Stefan Dickers, Archivist at the Bishopsgate Institute was looking through a box of uncatalogued photographs recently when he recognised the handwriting of his predecessor, Charles Frederick William Goss – the first Archivist at the Institute, from 1897 -1941 – and he realised he had discovered a set of around fifty pictures taken one hundred years ago to record the streets in the immediate vicinity. Unseen for many decades, it is my privilege to publish the first ever selection from these fascinating photographs today. 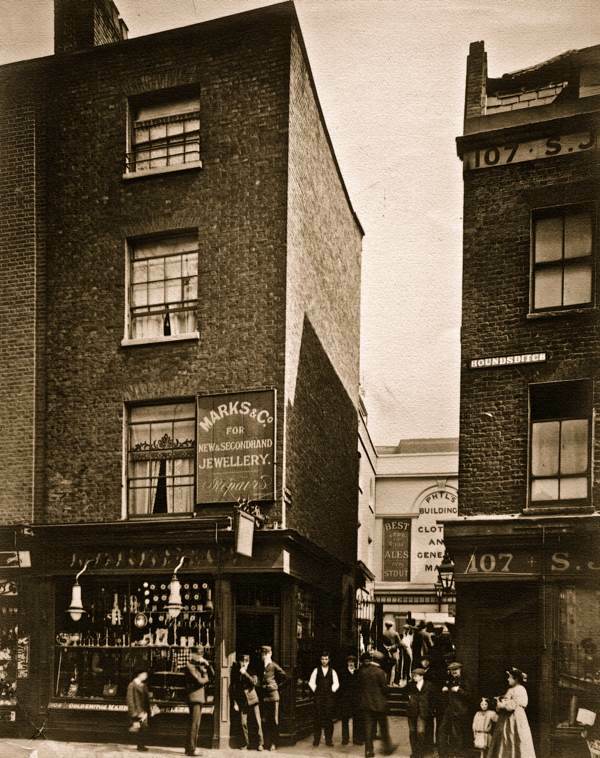 It is not known if Goss took these photographs or if he commissioned then, yet his inscription upon the reverse of “Railway Tavern, London St. Taken 8th October, 1911. Printed 1st December, 1911. 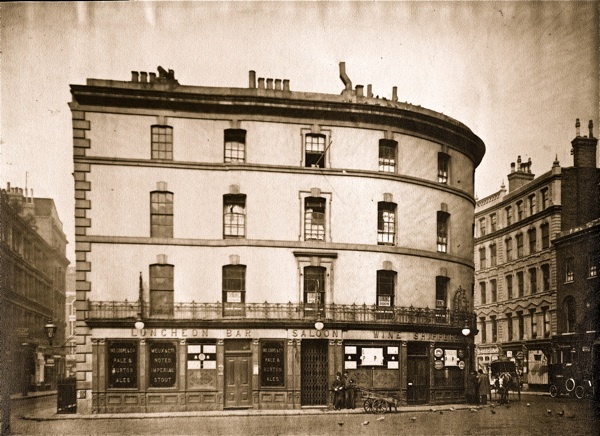 Demolished 1911.” suggests that he was the photographer. The son of a plasterer and of the first generation of his family to be literate, Goss built the foundation of the archive as his life-long vocation and later wrote, “The years I spent at Bishopsgate were the happiest years of my life.” And today, Stefan Dickers talks fondly of William Goss as if he were a personal friend, because Goss’ presence – signified by his careful copperplate handwriting – is everywhere in the archive. 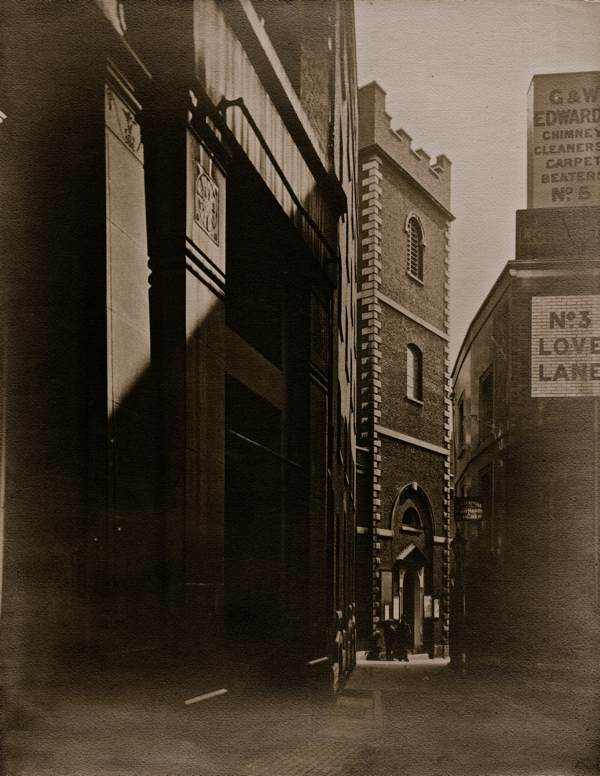 Compared to the photographs by Henry Dixon by for the Society for the Photographing the Relics of Old London, taken in the eighteen eighties, which mostly show buildings straight-on and in which the people are incidental, many of Goss’ photographs possess a more apparent subjectivity. The nature of the set of the pictures manifests the purpose of recording the streets as they were in Goss’ time, but there is also a poetic sensibility at work that seeks to contrive artistic compositions and in which the presence of people is integral to the pictures. In “Savage Gardens, east side, 5th June 1911″ a boy is caught in the very moment of swinging a cricket bat. He is the only living thing in a picture filled by the architectural grid of the terrace behind him, and his presence reveals the tension – between recording the buildings and the fleeting drama of human life that passes before the lens – which characterise Goss’ pictures. 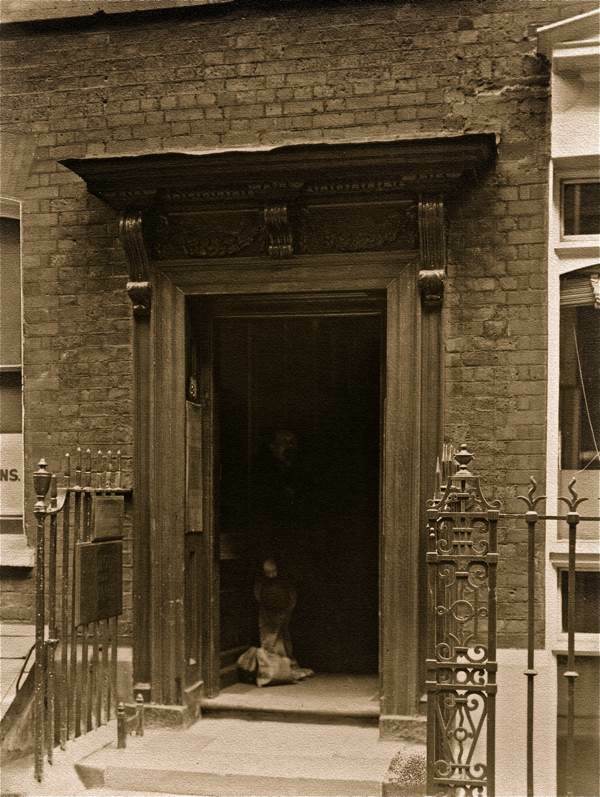 Equally intriguing is “Doorway, 3 Fenchurch Buildings, 28th October 1911″ in which a man stands in the shadow just within the door. The photographer could have asked this man to move or waited until he had gone, yet he chose to include him and by doing so he transforms what might be a routine architectural record into a compelling image of permanent enigma. 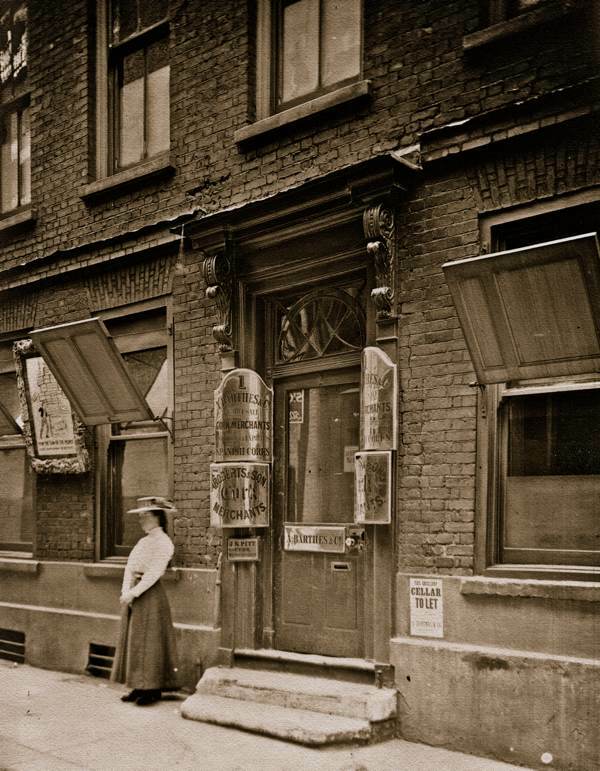 The girl in the hat standing in “1 Savage Gardens, Aldgate, 5th June 1911″ proposes another unknowable drama. The key element in the composition of the photograph, her presence invites speculation that cannot be resolved. 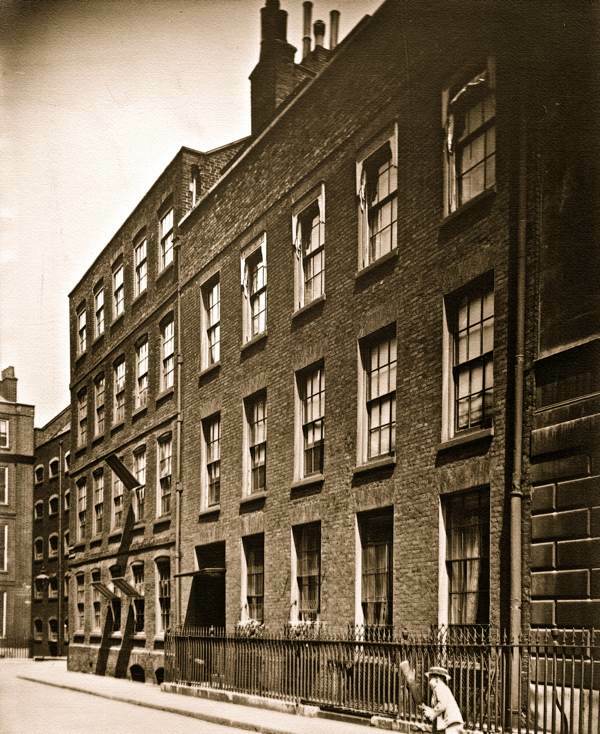 Goss’ abiding concern, reflecting his own family background, is manifest in the vast London collection at the Bishopsgate with its strong emphasis upon the lives of working people. 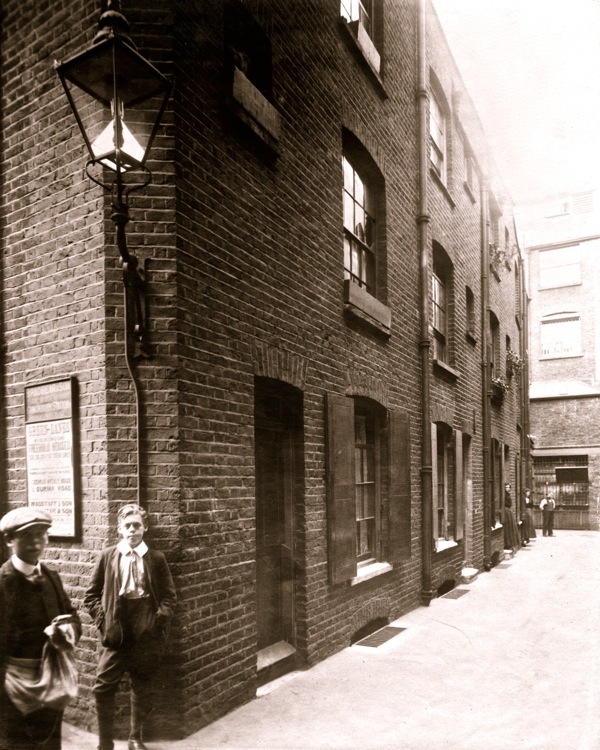 A concern illustrated sympathetically in “Borer’s Passage, entrance to Old Clothes Market, 16th July 1911,” in which people become the central subject of the photograph, taking precedence over the buildings. This is an image that is closer to street photography than architectural documentation. Goss’ curious pictures reveal something of the essential nature of photography as a medium premised upon the capture of the ephemeral moment. My own experience has taught me that setting out to make a photographic record of the present day sets you apart, even as you are in the thick of the crowd, and makes you more vividly aware of the transience of the drama of life surrounding you, imbuing the everyday with an irresistible poignancy. And, from the evidence of this set, I suggest that whoever took these photographs felt that emotion too. 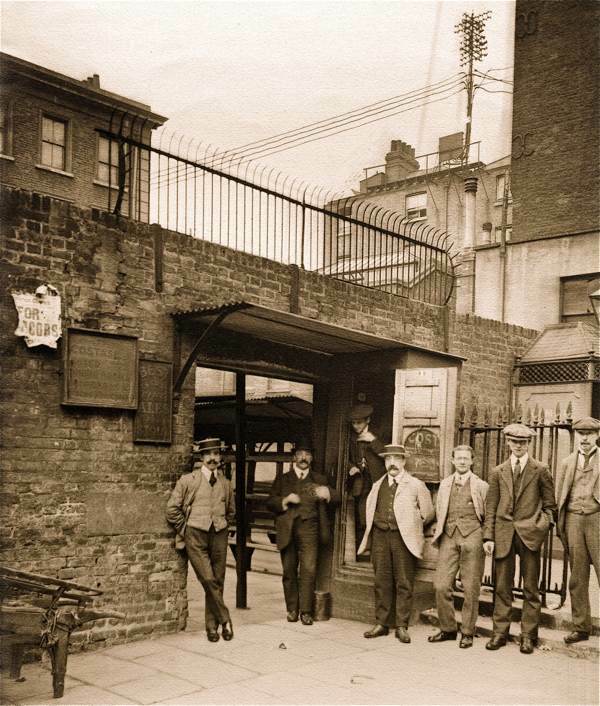 Railway Tavern, London St. Taken 8th October, 1911. Printed 1st December, 1911. Demolished 1911. 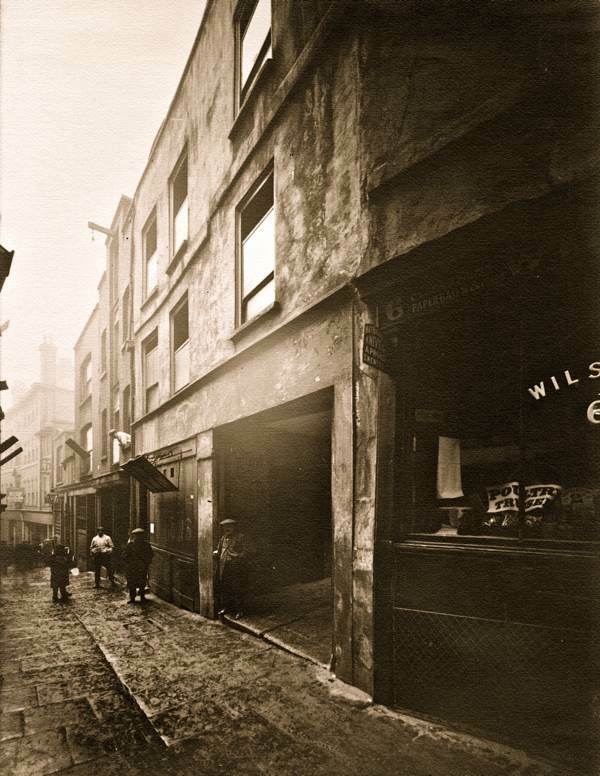 What a wonderful walk through these streets a hundred years on. Thank you. 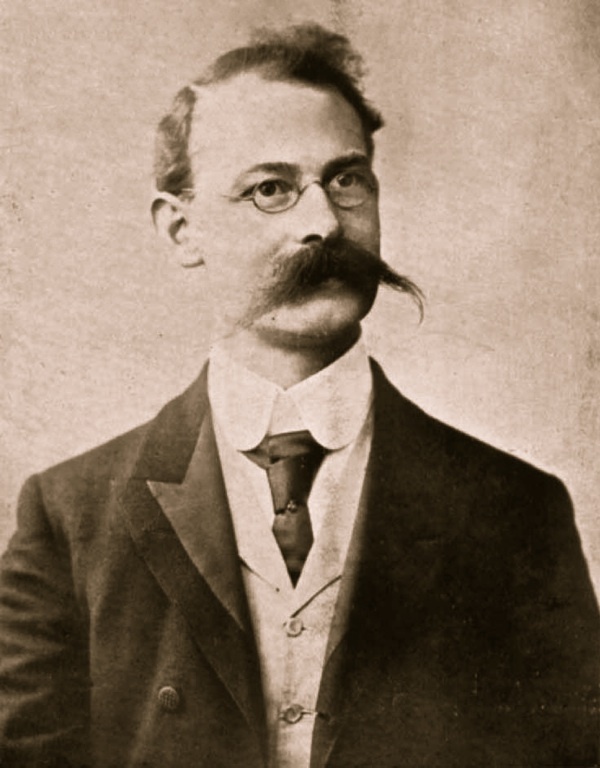 And what an incredible moustache Charles Frederick William Goss was sporting. I just love looking at these old photographs. I find myself wondering who the people were and what happened to them. All the more because my family comes from the area. More please! It is interesting to note the lesser noted things of this bygone age. The telegraph poles with the wires crossing high over the street and the fact that all working men wore caps. In the one of Fish St. Hill, what is that thing that looks like Trajan’s column? 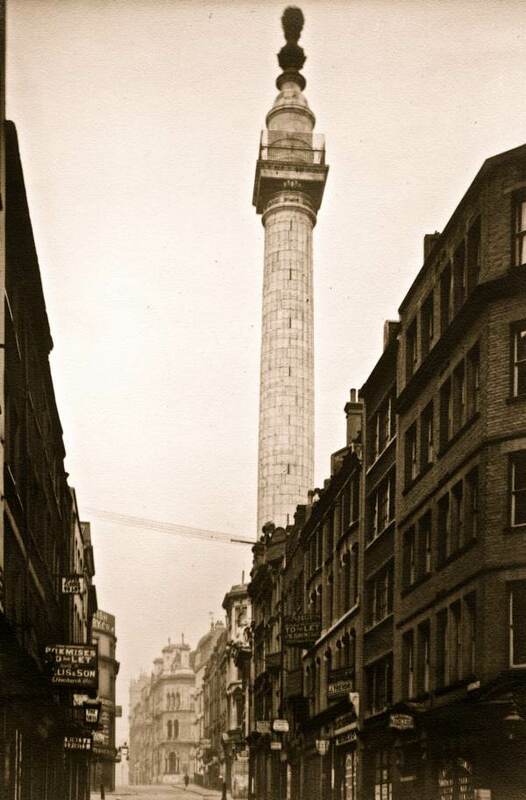 The column in the photo of Fish St Hill is the Monument commemorating the Great Fire of London in 1666. 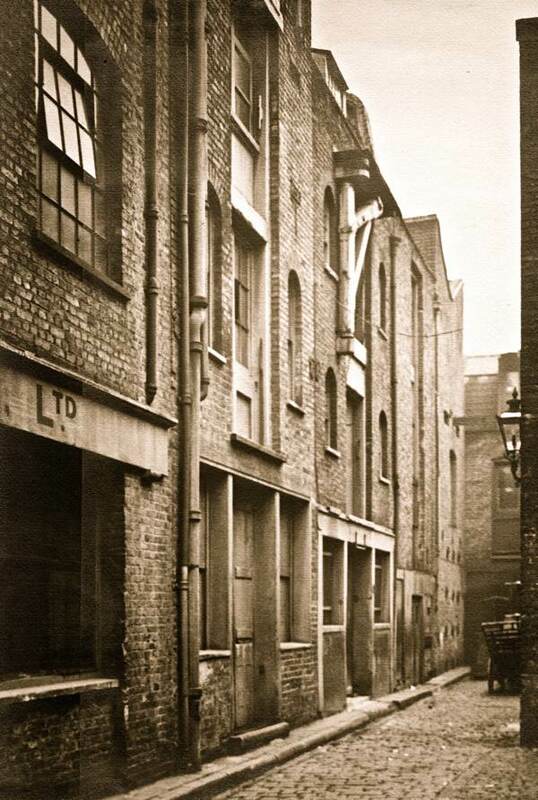 The height of the column is equivalent to the distance from the base to where the fire started in Pudding Lane. I started work in 1961 in the building which replaced the one at 48 Gracechurch St which can be seen facing the top of Fish St Hill. Thank you for posting these superb photographs. And thank heavens for Mr. Goss and his fine eye. 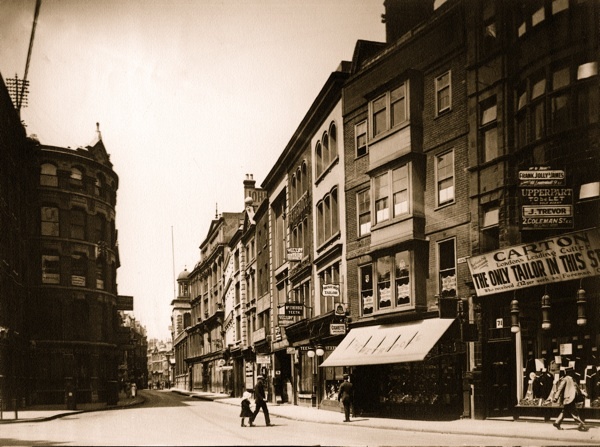 Mr Charles Goss lived to see the further demolition of London in World War II.